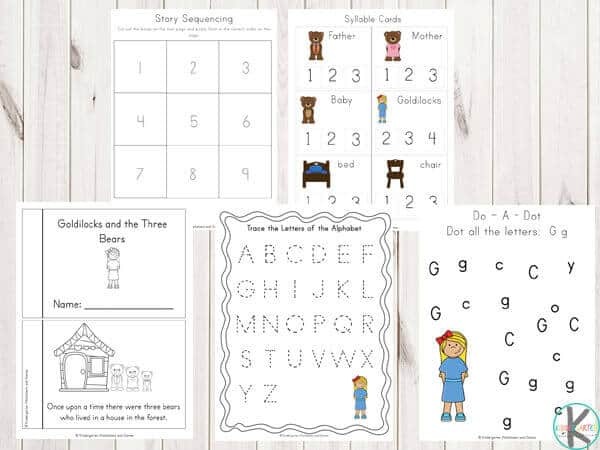 Kids will have fun learning a variety of literacy and math activities using these free Goldilocks and the Three Bears Worksheets that are guaranteed to make kids excited about learning. 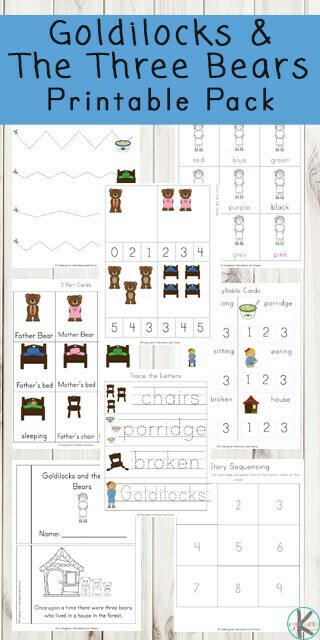 Print these Goldilocks and the Three Bears Worksheets to make practicing math and literacy fun. If you prefer, you can laminate these 80 pages and use with a dry erase marker and manipulatives to make these reusable. 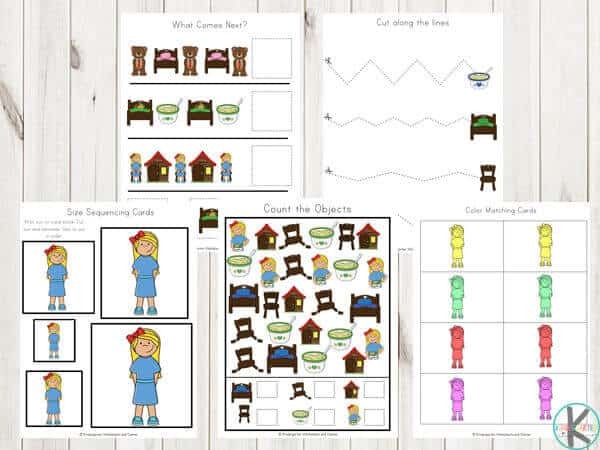 Sequencing – Cut out the boxes and paste them in the correct story order. Alphabet Cards – Cut out, laminate and use these cards to match the lower case letters to the uppercase ones. These alphabet cards can also be used to spell words. Trace the Letters – Kids will improve handwriting skills while practicing writing letters. Printable Trace the Letters of the Alphabet –Trace the uppercase and lowercase letters of the alphabet. Count & Trace the Numbers – Practice writing numbers from one to twenty. 3 Part Cards – These 3 part cards can be used to match the words to the picture or in a game such as memory. Beginning Letter Sounds – Cut out, laminate and use a peg or paperclip to clip or place a pom pom or candy onto the correct answer. Syllable Cards – Cut out, laminate and use a peg or paperclip to clip or place a pom pom or candy onto the correct answer. 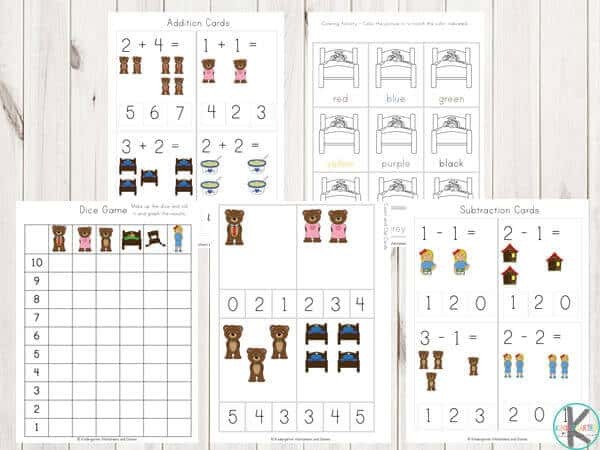 Counting Puzzles – Cut out, laminate and use the numbers to place the puzzles back together. Addition Cards – Cut out, laminate and use a peg or paperclip to clip or place a pom pom or candy onto the correct answer. Subtraction Cards – Cut out, laminate and use a peg or paperclip to clip or place a pom pom or candy onto the correct answer. Size Sequencing Cards – Cut out, laminate and place in order from largest to smallest or vice versa. Odd One Out – Circle the object that is different. What Comes Next? – Cut out and paste the answer in the correct spot. Finish the Patterns – Cut out and paste the answer in the correct spot. Coloring Activity – Color in the object using the color listed below. Do-A-Dot Letter Activity – Using a dot marker or bingo marker, dot out all of the correct letters. Dice / Graphing Activity – Cut out the dice and glue together. Roll the dice and graph each object the dice lands on. Color Matching Cards –Match the color; a great way to learn colors. Shadow Matching Cards –Match the picture with its shadow. Trace the Lines –Trace between the lines. Cut along the lines –Cut along the lines until you reach the picture. Stacey is an Australian homeschooling mum who has homeschooled their two boys from the start, centering their journey around our marvelous Creator. They love spending time together, exploring new ideas and places. Her blog, Simple Living. Creative Learning, was started as a way to share their homeschooling journey and is now a fabulous resource for everyone, comprising of fun activities, crafts, homemaking ideas, yummy recipes and lots of free printables.